The HUGS Project was founded in 2004 by Karen and Ray Stark in Oklahoma and now has over 3,000 registered members in all 50 states and more than 40 foreign countries. The Elkhart, IN chapter was started in 2006. 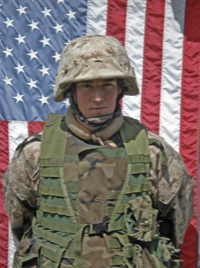 The mission of the HUGS Project is to place a HUG around the neck of every U.S. military person serving in the Middle East. What are HUGS? HUGS are handmade cooling ties that are worn around the neck and will lower body temperatures in extreme heat. Temperatures can reach over 130° F in the Middle East. The HUGS Project of Elkhart is a non-profit 501(c)(3) organization, dedicated to sending cooling neckties and care packages to troops in the Middle East. 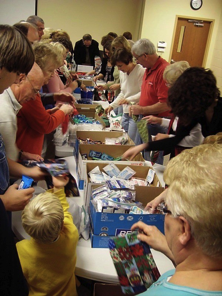 We are comprised of approximately 75 volunteers who give their time and talents to make HUGS and prepare care packages. 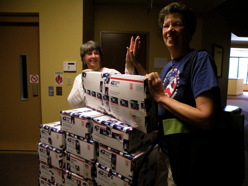 We pack and ship approximately 50 care packages monthly. Each customized package contains items specifically needed and requested by our troops in remote areas where base stores are non-existent or under-supplied. The HUGS Project of Elkhart relies on donations of money and care package items, as well as financial grants and other fund-raising efforts. 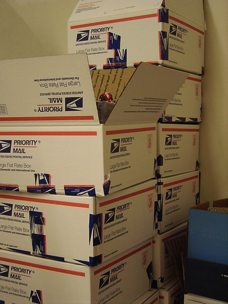 The money is used to purchase supplies for making HUGS, care package items, and for postage to ship the packages to our service men and women. Including the cost for shipping, a typical care package filled with HUGS, hygiene items, snacks, and other "tastes of home" costs approximately $50. Donate now!! In addition to financial help, we are always looking for volunteers! Activities include writing notes to service people, prepping care package boxes, volunteering at our workshops to make HUGS. You can also host a collection drive at work, school, 4-H, scouts, church, etc.